Alternator question, battery is discharging quickly. For a while until this Monday, I have been dealing with some mystery drain to my battery. I found it by accident while detailing the engine bay where I heard a faint electrical whine that seemed to come from the alternator which stopped after removing the battery lead. Before finding this issue, I'd have to keep a trickle charger connected to the battery or else it would completely drain within a couple weeks. It was attached when I found this problem. I left the lead off the alternator and disconnected the charger and left alone for a few days. After giving it a few days with the charger and alternator disconnected, I reattached the charger to see if it would attempt charging the battery but it didn't. It was fully charged so I can confidently say it was the alternator. -Battery is good, tested. Tried another in case. -Does the two pin connector need to be connected to the alternator? -If it's not a bad alternator (going to test it soon), any recommendations on what to check next? One of the pins on the alternator needs to be connected. It used to be connected. . When researching about it years ago I was under the impression that it was a redundant connection. So. . some time ago, about the time I converted it to EFI, I removed that connector to clean things up. Since it's been a while since I've done this, I do not remember where that wire goes. Is it switched or constant 12v? With that being said and before it's mentioned. . I never made the connection of the two because I thought the drain was related to the Haltec wiring and not this little single wire connection. I believe switched. The main power wire is of course constant. Sweet. . but what change would it have in my case if that connection is switched 12v? Last edited by FC Zach; 02-23-2017 at 11:01 AM.. When I connect the bottom pin to the battery lead on the alternator, the whine goes away. One of the pins needs to be connected to the battery, or a constant 12v+ source. The other pin pulls current through the idiot light. If both of these aren't connected, it will drain. 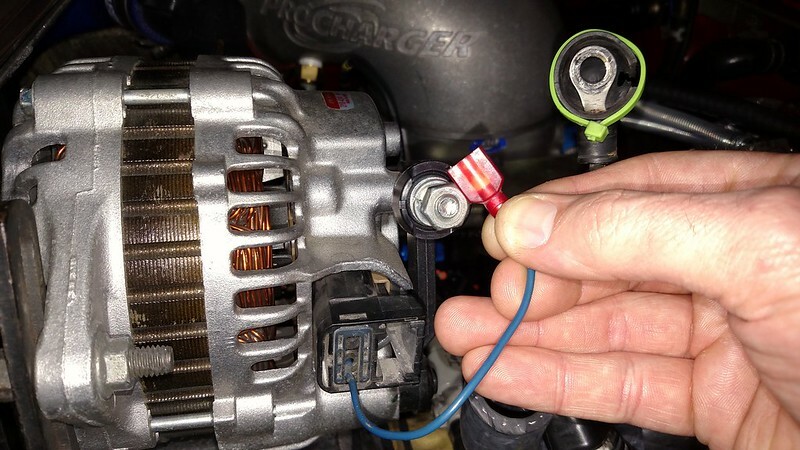 If you only have ONE wire run to the Alternator, you can use a resistor to mimic the difference in current at the alternator. Could I simply do this, connect here? I've never had the top wire (the empty spot in the connector) connected to anything. Is that recommended? It's necessary to keep the alt from draining the battery, unless you do a complete battery disco, which I usually do anyway because Rotary. One problem though. . I don't remember but does this connector have the "idiot light" wire you speak of? Yes, one wire is straight to the battery, the other pulls through the idiot light.